Less is so much more as revered musical Sunday in the Park with George returns to Broadway. The staging may be partial, but the music, humour and heart are all there in abundance. 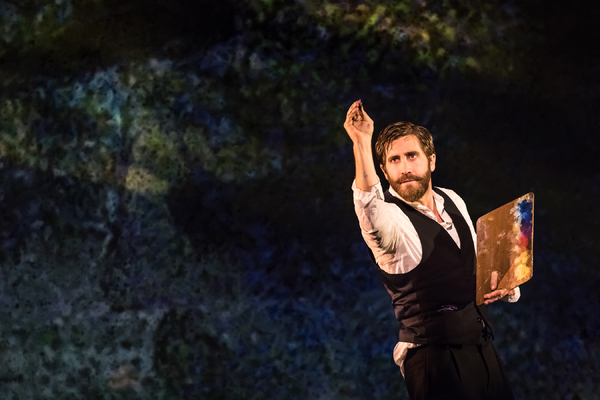 After creating a sensation in a four-night run at New York City Center last October, the stars aligned for the production to transfer to Broadway for an all too brief season. This revival of revered 1984 musical Sunday in the Park with George has served as the first production in the newly refurbished Hudson Theatre, which has not housed a theatrical production in this reviewer’s lifetime. Stephen Sondheim’s cherished score is given a luxurious treatment, especially by the uniformly excellent singing voices of the full company. Director Sarna Lapine, niece of book writer James Lapine, distinguishes herself splendidly in her Broadway directorial debut. 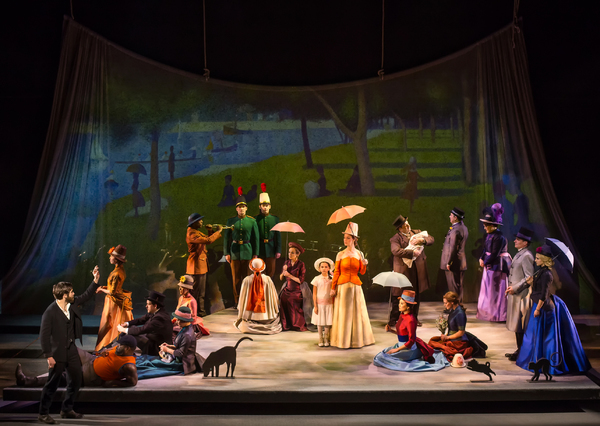 Apart from the very strong character work amongst the people that spend their Sunday afternoons on the Island of La Grand Jatte, a hallmark of Lapine’s work is the fully realised humour of the piece. This saves the show from being too stuffy and highbrow a piece, and ultimately allows the moving moments to land with even greater weight. 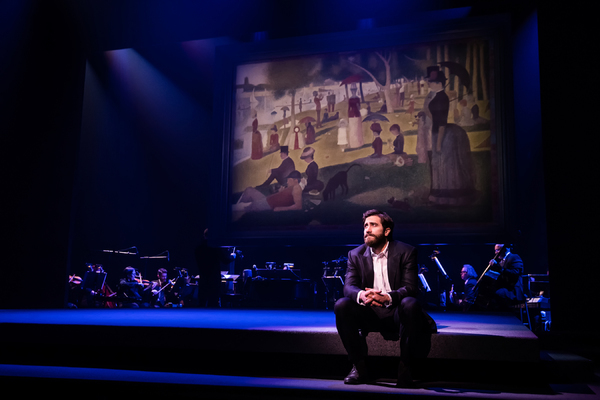 The staging places the orchestra on stage, seated behind a theatrically draped scrim curtain onto which animated projections (Tal Yarden) are displayed. Clint Ramos dresses the company bold secondary colours, using luxurious silk for the women. In a clever touch, each character’s act one counterpart is referenced in the colour choice for their act two costume. The centerpiece of the design is the truly stunning lighting installation representing George’s Chromolume #7. Scores of tiny globes fly down from the ceiling of the auditorium, rising and falling in undulating waves. Changing colours, the hypnotically beautiful globes seem to represent the sparks from fireworks. 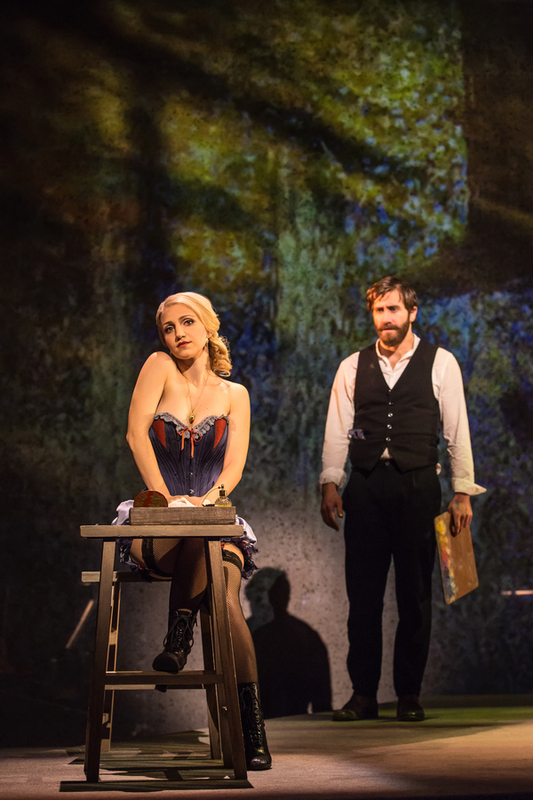 An established supporting player on Broadway, talented young actress Annaleigh Ashford has catapulted up the ranks to play the iconic dual roles of Dot (Georges’ model) and Marie (Georges’ daughter/George’s grandmother). Blessed with delightful comic timing, Ashford also has an attractively pure singing voice; she sings directly through the centre of each note without a hint of vibrato. Having won all of the audience’s hearts as dotty Marie, Ashford’s performance of Marie’s final reminiscence “Children and Art” is deeply moving. Notable supporting cast members include Brooks Ashmanskas and Liz McCartney as American tourists Mr and Mrs, Robert Sean Leonard as fellow artist Jules, and Penny Fuller as the cantankerous Old Lady who performs exquisite act one duet “Beautiful” with Georges. 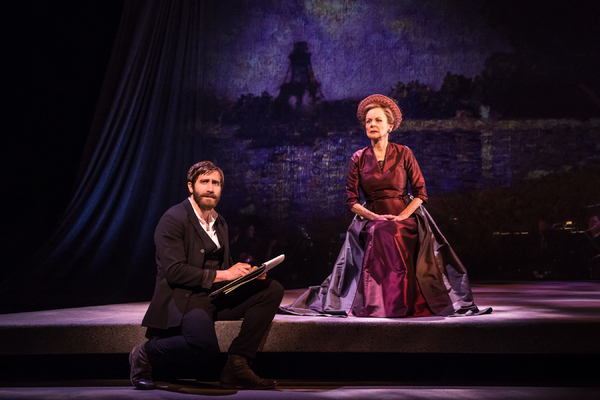 A highly memorable production, Sunday in the Park with George is Broadway talent at its unadorned best. Sunday in the Park with George was reviewed 8pm Wednesday 12 April 2017 at Hudson Theatre, New York. Seeing this this weekend. I am so excited! It’s a wonderful production. Hope you enjoy it as much as I did. 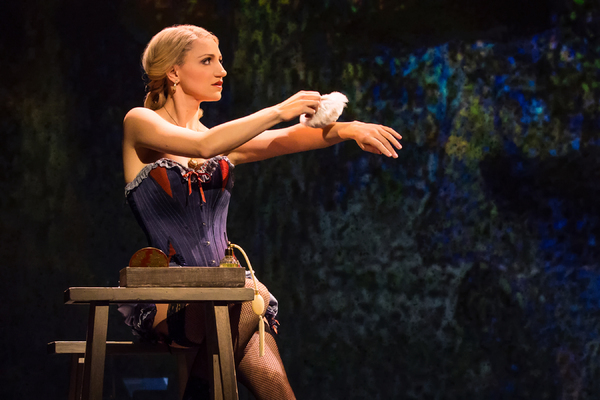 Simon – which would be your top five new Broadway show recommendations for a visit in July? Hey Rob, Hello, Dolly! and Dear Evan Hansen top the list, but tickets to these are quite scarce (and expensive). Unfortunately Sunday In The Park With George is now finished. Other picks are Anastasia, Great Comet and Bandstand. Avoid Charlie and the Chocolate Factory (and any shows that have run a long time). From last season, Waitress and School of Rock are top picks. Enjoy!